The 31% saying Trump is doing a good job of "protecting the nation's environment" and the 35% saying the same for "improving the nation's energy policy" remain low and well behind his predecessors' second-year ratings. Trump's current rating on the economy also trails George W. Bush's second-year rating but exceeds Barack Obama's. 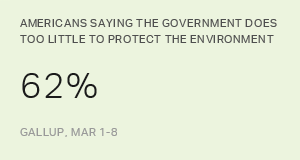 Gallup's 2018 Environment poll was conducted March 1-8 and found that Trump's ratings on all three issues are slightly lower than at the same time in 2017. At that point, the beginning of his term, Gallup asked Americans to predict how he would perform on each issue as president. That Trump's highest marks so far came just weeks after his inauguration repeats the pattern that both of his immediate predecessors experienced -- Obama's and Bush's highest ratings on all three issues were in their first year in office and were based on Americans' expectations of their presidencies. Obama's ratings on the issues each declined by 23 to 29 percentage points between 2009 and 2010. Bush's declines were less pronounced -- between one and 12 points -- likely reflecting the surge in support for him that occurred six months earlier, after the 9/11 terrorist attacks. Like Trump, Bush's best second-year rating of the three issues was on the economy, while Obama's highest rating was for protecting the environment. While campaigning, Trump promised big economic gains, and the nation saw improvements across a number of economic measures during his first year in office. Now, more than four in five Republicans and Republican-leaning independents say Trump is doing a good job of making America prosperous. Sixty-nine percent give Trump positive reviews for improving energy policy -- an issue on which his administration has overturned many Obama-era regulations. 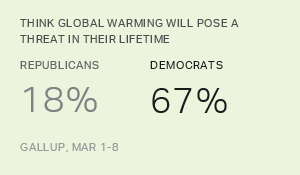 A smaller majority of Republicans say he is doing a good job of protecting the environment. Democrats and Democratic-leaning independents are far less likely to say the president is doing a good job on any of the issues. Like Republicans, Democrats' highest marks for Trump are on making the country prosperous; about one in five say he is doing a good job. Smaller minorities say Trump is doing a good job on energy and the environment. Democrats' negative perspective of Trump on these issues comes after a year in which the White House took many actions that angered environmental activists, including a recent order to allow offshore drilling in nearly all U.S. coastal waters. Do you think Donald Trump is doing a good job or a poor job in handling each of the following issues as president? Americans' reviews of the president's performance on making the country prosperous come as the U.S. stock market experiences significant volatility and has struggled to recover after dropping by 10% at the beginning of February. The percentage of Americans who say he is doing a good job might have been higher if it had been measured when the markets were at their peak earlier in 2018. Additionally, Trump's tax cuts are still new, and although they currently remain unpopular, approval for the tax cuts has improved since Trump signed the bill into law. 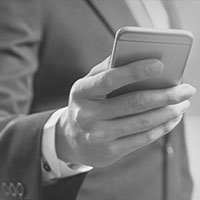 If the increases in Americans' paychecks lead to greater personal financial benefit over time, Americans could become more positive about his ability to help the country prosper. 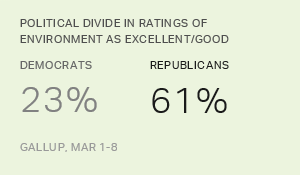 While majorities of Republicans continue to have favorable views of the president's handling of energy policy and the environment, Democrats give him very low ratings. This is unlikely to change soon, as Trump's administration continues to work at peeling away many Obama-era policies in these areas.